In June 1849, young Janette Riker’s widowed father decided to sell his farm to his brother and take his daughter and two sons to the Oregon Territory. What followed was a test of one youngster’s courage and will to live. Fourteen-year-old Janette has been given a journal by her father, one her mother received as a birthday gift from an aunt in Boston many years before. As she rides in the wagon pulled by their two oxen or walks beside them, Janette records her observations of their journey. Events are interesting, occasionally exciting, more often dull, but it isn’t until September, when they reached the Dacotahs, in a little valley at the foot of the Rocky Mountains, that they make camp. Leaving Janette behind with the wagon, Mr. Riker and his sons set out to hunt buffalo. At first, Janette decides they’ve merely been delayed, but as the days and nights go by, she believes they’ve gotten lost and are having trouble finding their way back. She goes about her chores as always, refusing to admit they may not come back. As the days lengthen and turn colder, however, she realizes she may have to make a decision, to stay and wait, or go on alone. The choice is taken out of her hands when it begins to snow and the oxen are attacked by wolves. One is killed, the other so badly wounded it may soon die. Janette forces herself to shoot the suffering animal, then butcher it, because her supplies of victuals is beginning to run low, and winter will soon set in. Thus her sojourn in the little grassy valley at the foot of the Rockies begins. Based on the actual account of fourteen-year-old Janette Riker who was stranded on the way to the Oregon Territory when her father and brothers went off to hunt and didn’t come back, this novel might be better titled Survival rather than Stranded, for it’s a paean to the ingenuity of a young woman abruptly finding herself alone in a hostile place. Janette continually descries her misfortune to be female and therefore not taught how to shoot or trap or do any of the things her brothers had learned, then shows her own resourcefulness in teaching herself how to do those very things. There is pathos and pain in the passages where she kills the ox, and later a baby rabbit caught in one of her traps, showing the still-frightened and gentle girl behind the determined façade, who knows she has to eat to survive but can cry over the way she has to go about obtaining food. Janette’s terror when wolves and other mountain predators attack her little makeshift cabin is intense and palpable. Her reactions to the beauty as well as the deadliness of the countryside around her often waxes poetic in the descriptions she puts into her diary. Author Mayo has written a beautiful story of pioneer hardiness and the determination to survive. Though Janette is the only character and narrator for most of the story, there are no dull spots or slow places. The framework, that of a young girl sitting with her dying great-grandmother and finding the diary, thus discovering when the old woman faced a much worse death than the one currently hovering, is well-done and fitting. 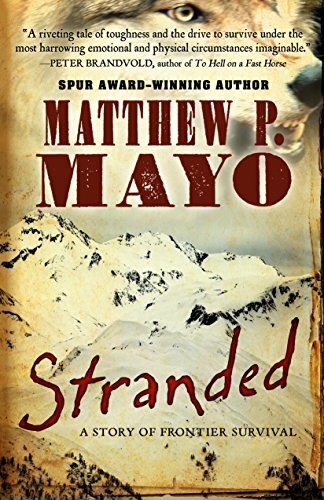 Several of Mr. Mayo’s novels have been optioned for films; Stranded is another that would also be included.